The tree stood on the grounds of Washington's home at Mount Vernon, about 30 kilometers south of Washington, D.C. The huge estate sits along the Potomac River, just south of Alexandria, Virginia. Today, George Washington's Mount Vernon is a popular stop for travelers, both Americans and visitors from overseas. The tree, a Canadian hemlock, was planted near the entrance to a garden on the property. It had a sign that read "circa 1791" on it -- the year that people thought it was planted. Rob Shenk works for George Washington's Mount Vernon. He published a photograph of the damaged tree on Twitter last weekend. He wrote, "The DC area lost a lot of trees yesterday, but maybe none more significant than this 1791 Canadian Hemlock at Mount Vernon. George Washington himself likely knew this tree..."
Dean Norton is the director of horticulture at George Washington's Mount Vernon. In a video published on social media this week, he talked about the history of the fallen hemlock. "You hate to see it, but it happens," Norton said in the video. He described the fallen hemlock as a "living witness to the life and times of George Washington." The policeman wrote down my name and address. She took down the tablets in one gulp. He's been away for at least a week. Several aircrafts were intercepted and brought down. 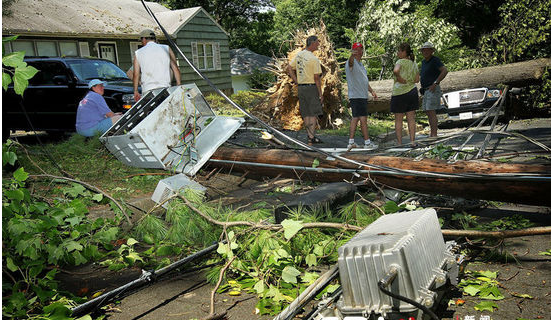 5.Hundreds of thousands of people lost power for one or more days. Hundreds of thousands of people took to the streets to mark the occasion. 6.Huge trees came crashing down. Barriers to entry in almost every industry have come crashing down, opening vast opportunities for small companies. Fear and shock spread across the globe as the twin towers came crashing down and thousands were killed.